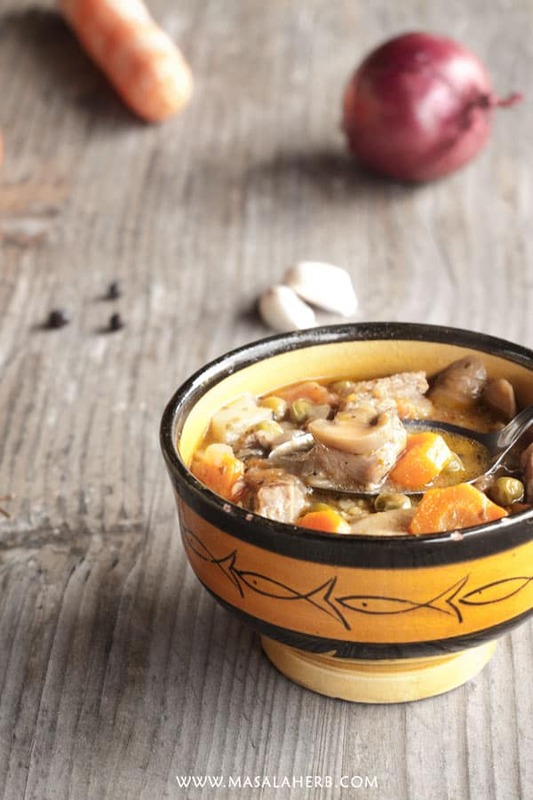 This winter veal stew will warm up your freezing bones and make you want to fill up another bowl before it's over. The french ragout is easily prepared and doesn't compromise on taste. YUM!! You can use a normal soup pot to prepare the stew or use a pressure cooker. Peel and slice your onion. Add to the pot the oil, heat up and fry the onion slices soft. Then add the veal chunks and stir fry. Peel your carrot and cut into rounds. Add the carrot bits to the pot with the marjoram (or Oregano) and Thyme. Cut the clean tomatoes into smaller cubes, chop your garlic and add to the pot while stir frying the content for a minute. Then season with salt and pepper and add a flat tablespoon flour. The flour will help to bind the stew. Mix/stir fry quickly. Then continue to add in the juniper seeds and the bay leaf. Chop your leak and throw into the pot together with the roughly cut clean lovage leaves (optional). Then add in the green peas and cut the turnip (optional) into smaller cubes and add that too to the pot. Mix it all well. Next thing slice your clean mushrooms and add them to the pot too. Mix the content well and pour in your stock. Cover and cook until meat is soft. If you cook it in a regular pot it will take about 90 minutes to cook. In a pressure cooker, you can cook the veal stew in 30 minutes and the meat will be soft. If you cook in a regular pot you might need some extra water if the content is getting too dry.